Integrating internationalization into the ethos of institutions requires vision, leadership, and engagement of administrators, faculty and student services. Whether as senior international officer or head of a department, those leading internationalization need a wide range of resources to plan ahead but also to respond just in time. Curriculum integration of study abroad and expanding curricula with international students’ perspectives are important, as is internationalizing curricula across all disciplines. Timely commentary on current issues in internationalization, as well as information on trends and overviews of research. 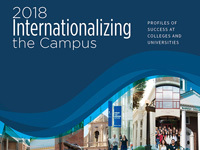 The Simon Award recognizes colleges and universities that are making significant, well-planned, well-executed, and well-documented progress toward comprehensive internationalization—especially those using innovative and creative approaches. With nearly 10,000 members on more than 3,500 campuses in the United States, NAFSA is uniquely positioned to be a force for internationalization of higher education.